Her feet kick up small swirls of dust from the tightly packed dirt roads that serve as the streets of this hilly, loosely organized neighborhood in Kigali, Rwanda’s capital city. Around her, the world swirls, too. She sees two women balance massive water jugs on their shoulders as schoolchildren weave their way around them in a game of tag. Every few minutes, a motorcycle taxi—the preferred method of transportation here—cuts short the children’s laughter as it kicks up dirt in its wake. Corn sprouts up in random patches. Overgrown, undeveloped lots are the closest things to parks here. 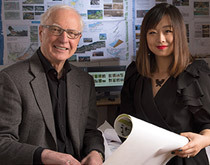 If one thing’s certain, it’s this: Carnegie Mellon urban design graduate student Suzy Li is not in Kansas—or Pittsburgh—anymore. Li and four fellow graduate students, along with faculty member Jonathan Kline (A’98), have arrived for their Sustainable Urbanism Studio, the final semester of the year-long Master of Urban Design program in the School of Architecture. Led by two representatives from Kigali’s Department of Planning, they’ll spend 10 days snapping pictures, taking measurements, and getting a feel for Kigali and its citizens before returning to Pittsburgh. Once back on campus, they’ll spend two months brainstorming changes to the city’s zoning codes and the implementation of sustainable ecological infrastructure, such as micro-wetlands, bioswales designed to remove silt and pollution from surface run-off water, and green roofs. It might be hard to fathom that a city with large sections that resemble black-and-white photos of 19th-century American industrial towns has plans to become the “Singapore of Africa” in the next few decades, as Rwanda’s president recently declared. It’s possible, but it won’t come easily. Rwanda’s sprint toward urbanization is much of the reason this international studio has decided to return with students for a second year in a row. In Kigali, the obstacles to urbanization and smart growth begin literally at the ground level. Many roads are barely wide enough to let a single car pass, let alone the thousands that use them as pedestrian highways and street malls. Cinderblock buildings topped with corrugated roofs line the roads, their front facades at random distances from the street, like keys popping out of a piano. Not all of Kigali looks like a rural village. It’s where, of course, CMU offers graduate programs in technology. Most of the city, including the old downtown, is made up of one- and two-story buildings, but its new downtown has recently seen the construction of several mid-rise steel and blue-glass buildings that dwarf their neighbors. Oddly enough, these alien towers are what most remind Li of her childhood. As she got older, buildings like these started popping up in her sleepy village. Watching the change sparked her interest in city design and urban planning. The similarities between Kigali and Li’s hometown are no accident. China has been active in Rwanda for decades; loaning the government money for new roads and infrastructure, as well as building and donating hospitals. The recent construction has been accompanied by Rwanda’s impressive economic success over the past decade, most notably an annual GDP growth of more than 8 percent and a 250% jump in per-capita earnings. That growth has trickled down to things like clean water supply. In 2000, less than half the population had access to clean water. By 2010, approximately 75% did. Knowing that Kigali’s meteoric growth is just beginning; Li and the other students have made the 7,000-mile trip to do their part to ensure that growth is both smart and sustainable. Over the next 10 days, they’ll traverse miles, speaking with planning officials and residents along the way. They’re trying to get a good grasp of what is, before they get to work on what could be. It’s incredible experience for the challenges they will face over the course of their careers. Long before these students take that first dusty step in a developing country, they develop and refine their skills in Pittsburgh at the Remaking Cities Institute within Carnegie Mellon’s School of Architecture. There, they work in communities and in the studio, learning how to remake cities, such as post-industrial Pittsburgh, or make cities, in the case of Kigali, using public outreach, community engagement, and sustainable means. With only eight years under its belt, the institute is still young. But its roots stretch nearly two decades into the past, to a time when no one was quite sure what Pittsburgh would look like in the 21st century. By the late 1980s, Pittsburgh, the self-proclaimed Steel City and capital of America’s rust belt, had witnessed the loss of more than 100,000 manufacturing jobs to developing countries, mostly in the Far East, according to Donald Carter (A’67), director of the Remaking Cities Institute. Industrial cities across the country—Detroit, Cleveland, Buffalo—were also suffering. But it wasn’t just an American problem. European industrial regions like the Ruhr Valley in Germany and the Midlands in the United Kingdom were experiencing similar downturns. They had put all of their eggs in one basket and were caught flat-footed when technology allowed the developing world, with cheaper labor costs, to enter the market. It was as if the bartender had flicked on the lights when everyone was expecting to stick around for a few more decades—at least. In England, Prince Charles was sorely aware of the economic crises affecting English, Scottish, and Welsh industrial cities—and frustrated by the seeming dearth of practical solutions. Here in the United States, Carnegie Mellon architecture professor David Lewis, had been pushing for thoughtful and balanced urban and economic development for years, even way back when Pittsburgh, and manufacturing, were still sitting pretty, albeit with a dusting of fine soot. The two had met at a meeting of the American Institute of Architects in Washington, D.C. They dreamed up a convening, the Remaking Cities Conference, comprised of hundreds of experts, including architects, market economists, government leaders, and citizens. They would put their heads together to discuss the future of industrial cities. If two heads are better than one, imagine what hundreds could accomplish. In March 1988, nearly 350 delegates arrived in Pittsburgh from places like Glasgow, Youngstown, and Dublin. The plot points for each of the cities were eerily similar, regardless of country or continent. Manufacturing job losses had led to a decline in private investment, then population loss, and eventually abandoned factories, vacant houses, and plummeting real estate values. The causes and the symptoms were clear. Solutions, however, were not. Plenty of potential remedies were advanced—public and private partnerships, huge investments in education—but no frontrunner emerged. Realizing the desperate need for more research, Lewis, Carter, and other colleagues began forming CMU’s Remaking Cities Institute, which would provide a research link between academic work at Carnegie Mellon and professional urban-design work. As Pittsburgh looked for ways to reinvent itself, the CMU professors urged those looking to revitalize the city to invest in the treasures it already had—its historic neighborhoods, main streets, downtowns, and rivers. But more than just encouraging financial investments, they also talked about residents’ emotional investment in their own neighborhoods. Too often, Carter says, community revitalization consists of “the major stakeholders making all the decisions—the mayors, the governors, departments of transportation—without really consulting the citizens,” leaving residents emotionally detached from their neighborhoods. Unsurprisingly, when the jobs left, the people did, too. Lewis had first begun addressing this problem in the early ’60s with the Urban Laboratory, a program which brought architects, planners, and Carnegie Mellon students into neighborhoods like the North Side and the Hill District to conduct hundreds of interviews with residents, community groups, and government officials. All of the conversations started more or less the same way: What are your dreams for your community? Before Kigali, Li tackled that kind of project in Pittsburgh. She had to come up with a creative plan to redesign an urban corridor between two residential neighborhoods. The area in question is a no-man’s land of car dealerships, tire stores, and garages. It’s also home to a treacherous intersection where five different roads converge—described by Li as a “chicken foot.” Meetings with residents in the Urban Laboratory revealed that residents’ biggest concerns revolved around how difficult, and dangerous, the area was for pedestrians—a concern commonly expressed by urban residents. Rather than push the car dealerships and auto stores out of the neighborhood, Li embraced them. Her redesign called for making the area the “auto center of Pittsburgh,” concentrated around a high-density, mixed-use hub of auto dealerships, related retail shops, and residences connected by elevated pedestrian bridges. The hub’s first level, an outdoor walking mall, would include a car museum, car-themed restaurants, and a showroom centered on a lush park. The second story would be home to an elevated “race track,” lined with pedestrian walkways. Consumers could test-drive vehicles while local residents walked or jogged along the track. It was an ingenious, and safe, space for neighborhood walking clubs to get their daily exercise—something requested in the early stakeholder meetings. Though this project was just an exercise, the response from the community was overwhelmingly positive. It’s this type of rethinking of how humans live with one another that the institute and the urban-design program champion. This past October, the Remaking Cities Congress convened on Carnegie Mellon’s campus for the second time, 25 years after the first. More than 300 delegates brought perspectives from industrial powerhouses on both sides of the pond, like Rotterdam, Bilbao, and Liverpool, New Orleans, Milwaukee, and Buffalo. Prince Charles, who gave the keynote address, was presented the American Institute of Architects President’s Award. This time, however, the world—especially Pittsburgh—looked a bit different, its journey presented by Carter in a lecture called “The Pittsburgh Story.” Housing parks, retail centers, and offices have replaced factories and steel mills. Regional employment is up 13%. Pittsburgh supports a diversified economy, with jobs in higher education, banking, medicine, and technology, as well as tourism. Manufacturing, which once comprised 30% of the city’s economy, now accounts for only 10%. The city once described as “hell with the lid off” has even earned the distinction as one of the most livable cities in the world from major global publications—multiple years in a row. Once the “poster child of decline,” Pittsburgh is now the “poster child of transformation,” says Carter. But the Congress was not just a retrospective on Pittsburgh. It was a forum for urbanists from around the world to share lessons learned, successes achieved, and failures suffered. With representatives from cities like Turin, host of the Winter Olympics in 2006, and Detroit, which just filed for bankruptcy, attendees heard from the entire spectrum of revitalization efforts. On the African continent, Li sits with her classmates in Kigali International Airport, waiting start their long journey back to the Steel City. She can’t help but notice the faces of those arriving and departing, and how so many of them belong to Chinese construction workers. Interesting, too, are the wide range of cities on the departure board. There are the expected African destinations—Nairobi, Mombasa, and Johannesburg. But the board also lists a few surprises—Amsterdam, Doha, Dubai, and Istanbul—all developed cities, all telling signs of just how far the country has come in the two decades since the Rwandan civil war and genocide. But if Kigali’s airport is to offer more than the dozen or so non-African destinations it currently does, the city will have to ensure that its growth is not just rapid, but smart, and that it makes sense not just next year, but next century, too. Downtown, that means not importing foreign design and architecture concepts. Glass and steel buildings might work fine in cooler climates, but in East Africa, just south of the equator, they require much more energy to cool. Here, passive architecture, which uses things like natural ventilation and the sun’s warmth, without mechanical assistance, would go much further. In the coming centuries, if wet and dry seasons become less predictable, how Kigali manages its water supply will likely determine whether the city lives or dies. But it’s not just about managing its supply of drinking water. Because many neighborhoods lack adequate drainage, there is nothing to slow storm water down the hillsides, leaving large swaths of Kigali vulnerable to flash floods. Sandbags have become permanent fixtures. That’s where the Carnegie Mellon students come in. Their recommendations for rural Kigali’s storm-water management include things like bioswales—wide, gently sloped channels filled with vegetation that help absorb rainwater—and green roofs—roof gardens that retain water and slow storm-water runoff. Both help mitigate flooding by slowing water’s downhill movement when storms roll in. For zoning, Li and her peers recommended widening the city’s streets to allow for simultaneous auto, foot, and bicycle traffic, and enforcing “maximum setback lines” that dictate the maximum distance buildings can begin from the street, which would greatly level out the piano-key look of its buildings’ front facades—and allow for wider streets. If the day comes when Li sees those hilly “roads” again—the dusty ones that blistered her feet but opened her eyes—she can only hope they’ll be shaded not by corrugated roof overhangs, but by tree canopies. She can only hope that Kigali will have built environmental treatment centers that purify wastewater before it flows into Kigali’s wetlands, as it does now. Hope is all she has, because ultimately, their recommendations are only that: recommendations. Because of the Remaking Cities Congress and Institute, however, these are recommendations based on decades of studying and addressing urban problems. The city of Kigali is a long way away from worrying about how affordable its housing is, or how its research hospitals compare to other African capitals. But those goals are attainable—if the city focuses on a vision for a sustainable future. It’s not just about applying sustainable infrastructure for Mother Nature’s sake. It’s about investing in communities and making them wonderful places to live—not just now, but forever. If you improve a city’s quality of life—and give residents a hand in sculpting its future—people will never want to leave. If you also diversify the economy and make things like education and research top priorities, people will never have to. Perhaps with a little more help, Kigali won’t become the next Singapore. Perhaps it will become the next Pittsburgh.